We hosted Christmas for the first time in 2013. Earlier that year we had bought our home and excited about being first-time homeowners we invited our families to celebrate the holiday season with us. In preparation for my family coming at Christmas, I spent weeks thinking about the food for the holiday. I scoured culinary websites, flipped through food magazines and cookbooks, and perused my own recipes for inspiration until I felt like I had the perfect menu. Giddy with anticipation, I remember calling my youngest brother to share the menu for Christmas dinner. I went on and on and on about the consommé for the first course, pots de crème for dessert, and the beef tenderloin with the red wine sauce that would be nothing short of over the top. Stopping to catch my breath, I waited to hear him exclaim with enthusiasm about what we would be having. There was silence on the other end of the phone. When he finally spoke, it was to ask why we weren’t going to have Mom’s beef tenderloin for Christmas dinner. It was my turn to not speak as he talked about this being the first time he would not celebrate Christmas in our childhood home and how he really just wasn’t liking the idea of a totally different menu for Christmas dinner. That, to paraphrase, was just too much change. I got the point. While it’s easy to get caught up in the holiday madness, this time of year is really about those who gather around your table. It’s a time to celebrate the season, your shared history and the traditions that comprise it. This history may involve rituals like watching the Thanksgiving day parade or making mom’s beef tenderloin for Christmas dinner, but whatever your traditions are, I think that you’ll agree that incorporating these traditions into your holidays is what makes them memorable. 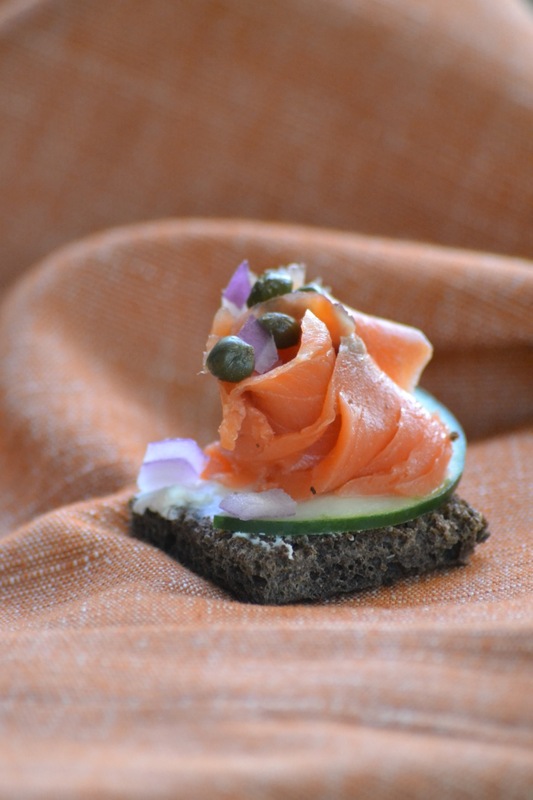 So in a nod to tradition, I include this simple appetizer for Smoked Salmon Canapés on my Thanksgiving menu. Like Mom’s beef tenderloin for Christmas is a tradition in my family, for my in-laws, Thanksgiving is always kicked off with smoked salmon and champagne. Having spent more than a decade’s worth of Thanksgivings with them, I can’t imagine starting Thanksgiving dinner any other way. I typically eat smoked salmon as part of a platter. This allows you to pile toast points high with cream cheese, copious amounts of salmon, red onion, capers and sometimes even hard-boiled eggs and/or caviar. Salmon served in this way is easy to prepare and always a hit. While a bit more work, assembling small bites in advance makes for an elegant appetizer, perfect for passing, that is every bit as tasty. Use a small 1-inch square cookie cutter to cut out about 18 small squares from the bread. Toast. 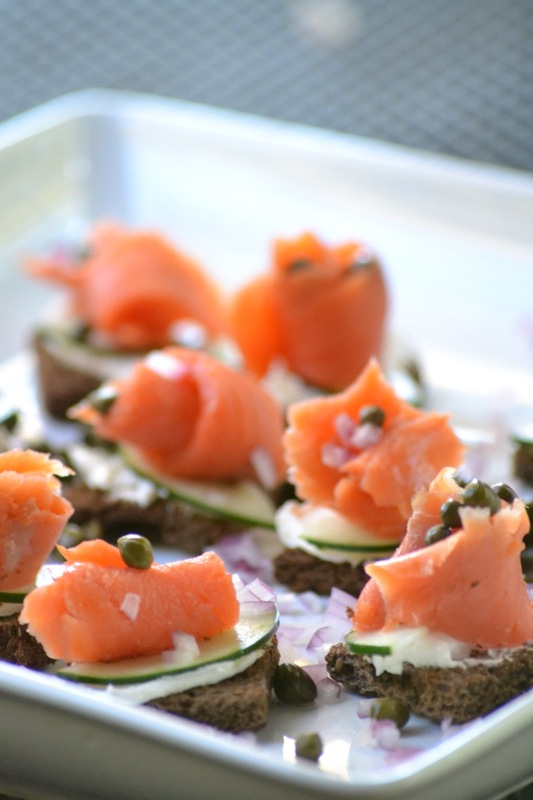 While the bread toasts, pull off small strips of salmon and roll them decoratively. Depending on how the salmon is cut, you may want to halve each slice to make a bite-size piece. Spread a little cream cheese (about ½ teaspoon) on each toast square. Top with a slice of cucumber and the rolled salmon. 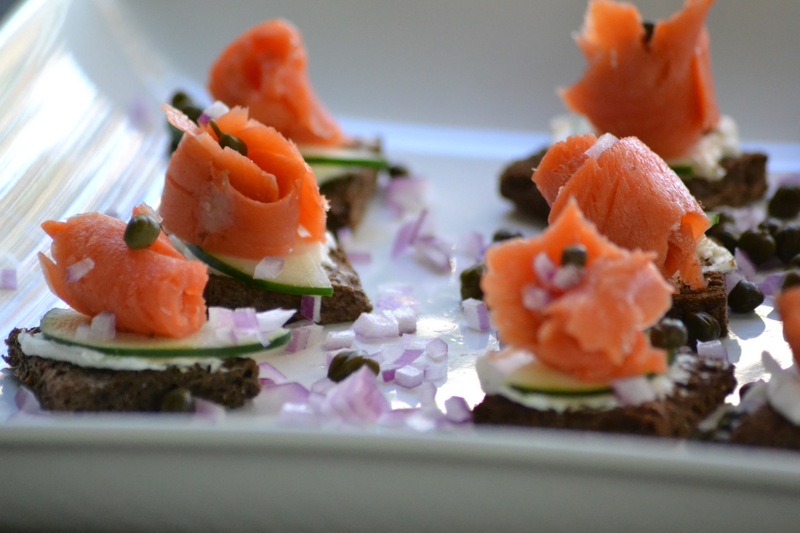 Place the canapés on a platter and sprinkle with the minced red onion and drained capers. Serve immediately.